With the vast choice in lighting, it can be difficult to know exactly what sort of lighting you should choose. This section explains all and sifts through any confusion. It is generally accepted that T8 and T5 tubes are the most standard type of lighting in aquariums at the moment. T8 indicates the tube diameter which in this case is one inch. If you use T5 lights, the diameter is 5/12”. The most popular brands are Arcadia and Interpet. If you buy a Juwel tank for example, the chances are you have 2 x T5 tubes and you’re able to swap these lights over should you wish. But what are the key points to look out for with lighting? The first point is make sure it is suitable for planted aquariums – this will be apparent from the description on the packaging. Quite often manufacturers will have wonderful graphics on the packaging which should catch your eye. But the next question is which one should you buy? Before I explain more about which lighting to choose, it’s important to understand more about lighting. All light has colour and the colour temperature of light is measured in Kelvin, so when you see a description which states it has a particular K value (kelvin) it is referring to the colour of the light output. A low K rating would be 2500 and a high would be 18000. It is recommended that you aim for about 8000 K as this provides a pleasant colour output. But this is not to say that the lower K and higher K won’t grow your plants (on the contrary), it’s simply their light output is less desirable aesthetically to humans. A low K value is orange/yellow in colour – this tends to not do a great deal for the fish or plants in terms of how they look. At the opposite end of the spectrum, are 18000K which is a very bright white. This light output will grow your plants just as well as lower K tubes but it can give the appearance of your tank looking washed out. So this is why if you aim for lights with a K of about 8000k – you will achieve a colour that is just about in the middle and normally the most pleasing to the eye. You can mix and match lights without any problems too so don’t rule that out. There can be a temptation to purchase more powerful lights such as metal halides but this is not something that is recommended when you’re beginning. Higher lighting means everything in your aquarium needs to step up a level. By that we mean that your fertilising regime needs increasing, which in turn means you will be maintaining your tank more. In addition higher lighting requires the use of CO2. Lighting Duration. An average tank needs approximately eight hours of light per day. Having your lights on longer than this is not necessary and it will help to keep most algae at bay. It’s worth putting your lights on a timer and have them come on when you’re at home to make the most out of it. When your tank is very new and plants are settling in, I recommend to only have six to seven hours of illumination for the first month or so and any changes need to be done slowly (perhaps half an hour extra per week). 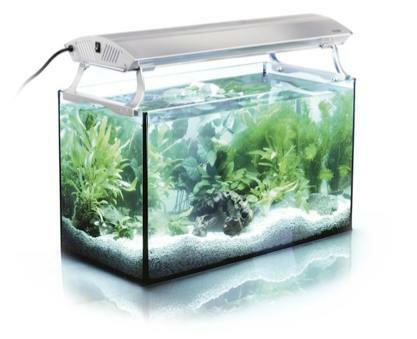 The image below displays an Arcadia luminaire which is a great way to illuminate an aquarium. Also consider TMC Aquabeam LEDs which are small and economical LED lighting units which have become very popular recently – running costs are a mere £7 per year. Great blog- i looked forward to seeing more of your products.